In the quest for the next big leap in television quality, some broadcasters and TV manufacturers seem to be favouring High Dynamic Range (HDR) over Ultra High Definition (UHD). HDR aims to generate a more lifelike viewing experience by greatly increasing the range of brightness on the screen so that it’s closer to the range we experience in real life. 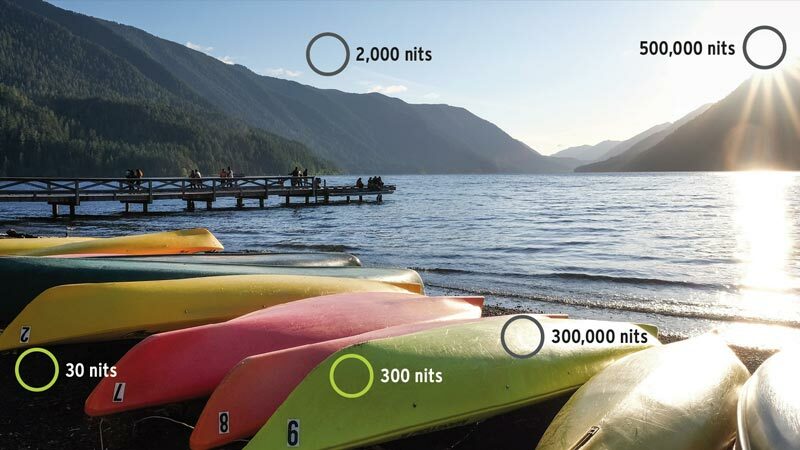 With brightness measured in nits, standard TVs peak at about 100 nits, whereas HDR TVs are currently benchmarking at around 1,000 nits. This makes for a very visible improvement, which is arguably more significant than merely increasing the number of pixels. So, what does this mean for productions shooting and delivering in HDR? Firstly, it’s crucial to find out what format of HDR you’re delivering in. There are currently many variations and no single standard on the horizon (if there ever will be). But if the production is for the domestic market, the chances are it’s going to be Hybrid Log Gamma (HLG). HLG is favoured by UK broadcasters, including the BBC (who part-designed the standard), for good reasons. HLG lends itself well to live broadcasts, such as sports, and the production process is the same as for standard TV. What’s more, HLG is backwards compatible with non-HDR TVs and is a relative standard, so the picture delivers the same artistic effect whether viewed in a sunny living room or a dark man-cave. As such, HLG is helping to smooth the transition to HDR. When it comes to filming, most acquisition cameras already support HLG. If not, then it’s acceptable to convert from the camera format to HLG when you ingest or create deliverables. What’s most important is to keep all the in-production formats the same: pick a working HDR system for everything and stick to it, converting to the delivery HDR format at the end. The Digital Production Partnership (DPP), a consortium of UK broadcasters, has issued a set of HDR delivery guidelines that provide a useful framework. Similarly, a working HDR system called ACES (Academy Colour Encoding System) has been developed. Although aimed primarily at the cinema market, it’s seeing cross-over into the high-end TV industry. ACES offers a standard production format for HDR and WCG (Wide Colour Gamut), and is future-proofed so that the specifications go well beyond what can be acquired and displayed on today’s TV screens – it’s the ultimate master and archive format. To work with HDR, post production houses not equipped to handle UHD will need to invest in their technology, such as monitors, storage/edit client bandwidth, UHD/HDR workflow orchestration and transcode software. The good news is that bitrates aren’t much different with HDR, so if you’re already working with UHD, there shouldn’t be additional storage costs. Also, editing systems have been quick to catch on to HDR. For example, Avid’s Media Composer now supports most HDR formats, including HLG. While it remains unclear which (if any) format of HDR will become dominant, the good news is that HDR is already relatively easy to work with – especially HLG. Not one to stand in the way of progress, I’ll be putting forward a capex proposal for a new HDR TV in my lounge! UHD and HDR: Not Just More Pixels, But Better Pixels Too!